I love mushrooms. Mushrooms just have such a rich earthy flavor and stuffing them is easy to do. 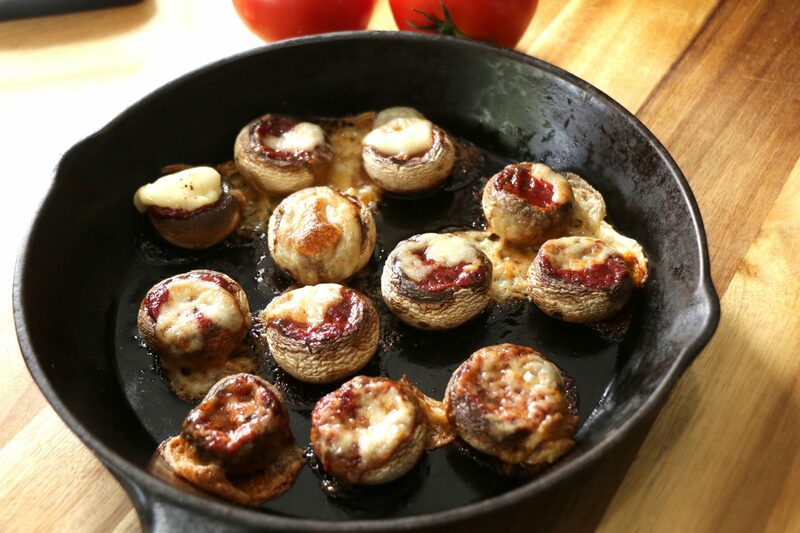 Of course, these Vegan Pizza Stuffed Mushrooms top my list! Gluten free and Vegan! Clean mushrooms and remove stems. Using a small spoon, scoop out inside of mushrooms to allow enough room for filling. In a small bowl , mix together the tomato paste, water, olive oil, sugar, salt and basil. Top each mushrooms with 1 tablespoon tomato sauce, 1 tablespoon vegan mozzarella. Bake 18-20 minutes or until mushrooms are cooked and cheese is browned and bubbly. These were awesome. So easy to make with the leftovers from your amazing pizza. I chucked some chilli flakes on to give them some spice.